High volume angle production can be achieved without "drops" in your material, even on our entry-level ABL-74T angle line. This high speed clip machine offers what few others do at higher prices: ZERO kerf, single-cut shear, and punching on both legs. With our 6" x6" x 1/2" capacity single-cut shear, you do not have a material loss (slug) for each shear process - saving you money every time you cut. For affordable tooling, the ABL-74T uses inexpensive punches and dies from Cleveland Punch & Die which last longer and process much faster than more expensive drill tooling. The ABL-74T uses all of your material right up to the last inch without relying on a measuring system that does not feed to the shear. Our ABL-74T is made with quality and pride for years of production and years of profit. The ABL-74T shear is designed for a long trouble free life, but with more features than competitive units. It has a single cut shear design, which means there is no loss of material when shearing, unlike some competitors' machines. The shear’s extra stiff design provides cleaner cuts with less distortion, and provides longer shear blade life. A separate part chute can direct short parts directly into a cart or bin. To achieve superior cut quality on all angle thicknesses, the reversible and indexable male blade is designed with four different corners to help match the angle with less distortion. The blade may be rotated to accommodate the different material thicknesses and sizes. The blade life is prolonged by using all four sides. It is also designed large enough to allow it to allow sharpening, which leads to an even longer life. This machine has two 74 ton punch frames, one single punch for each leg of angle. The punch has extend and retract limit switches to indicate when it has extended through the material and when it has fully retracted. These frames are designed for easy access to the punch and die. This provides quicker tooling change times for varying hole sizes. 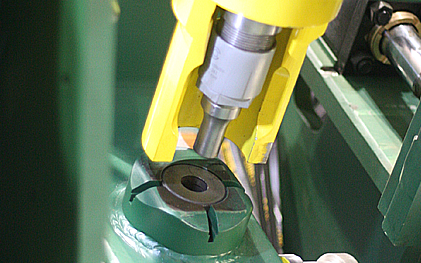 The punch frames are positioned hydraulically using a computer controlled hydraulic valve system. The valve system provides fast, accurate positioning of the punch frames. 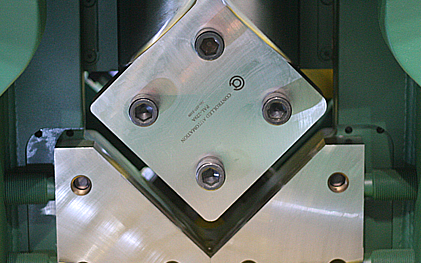 Each punch frame is unique in automatically positioning material against the die while the punch is retracting. This gives better hole quality and improved punch and die life. The punch units are also extremely rugged in design, which will provide exceptionally long service. The tooling holders are machined for locating keys and pins and for use with non-round punches and dies. The frame positioning wheel assemblies are designed to allow the frames to “float” when punching bent material which reduces stress. This material length measuring uses a single servo powered pinch wheel to pull the material through the machine on a non-powered “V-roll” conveyor. A separate measuring wheel contacts the material and rotates as the material is pulled through by the powered pinch wheel. The measuring wheel is located before the first punch frame. 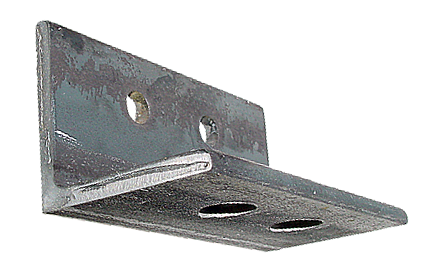 This is combined with the weld station to eliminate any material drop. The Weld/Tack Station is designed for a continuous feed of material through the machine and to eliminate the drop on the trailing end of the material. As the trailing end of the material passes the weld station the material will stop automatically and allow the operator to tack on an addition piece of material to continue feeding into the machine. The operator can choose to leave the weld in the part or shear it out automatically as a small piece of scrap. The ABL-74T control system has an easy-to-use interface. As the machine runs, the status of each part or operation changes in real-time. A part list dialog can be displayed to show which parts have been completed or which operations are remaining. The controller can be easily networked to the office computer for downloading of parts produced in the office and by most drafting and design programs. 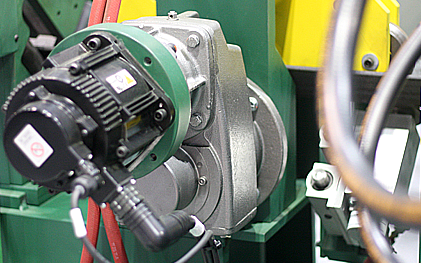 Parts can also be easily programmed at the machine, even while another part is being run. The main control software for all equipment comes complete with diagnostic capabilities and monitoring screens. This helps the maintenance personnel to easily trace down any possible problems which may occur. Every input and output relay can be checked via the diagnostics software. Additionally, each quadrature encoder input and digital to analog output can also be verified through the software diagnostics. Clips with minimal costThe ABL-74T is our most economical entry level machine for punching and shearing small angle iron. Single-cut shearThe ABL-74T shear is designed and built to give long trouble free life with more features than competitive units. It has a single cut shear design, meaning there is no loss of material when shearing. Punch both legs of angleUnlike other competitive machines, the ABL-74T uses one fast inexpensive punch for each leg of the angle without any unnecessary or costly drilling processes. Material positioningThe material length positioning uses a single servo powered pinch wheel to pull the material through the machine on a non-powered “V-roll” conveyor at speeds up to 180 FPM. Superior service & supportAs the most trusted name in service and support - Controlled Automation leads the industry for inexpensive parts and the highest quality service that speaks more from our loyal customers than any marketing. If you own a Controlled Automation machine, you are our customer and we will support you for life.